Just program PowerView to move your window treatments to the exact position you want and then control and schedule them using the intuitive PowerView App. You can also operate your PowerView shades using the PowerView Pebble® Control. Voice activate your PowerView shades with Amazon Alexa, Siri on your Apple devices, or the Google Assistant. 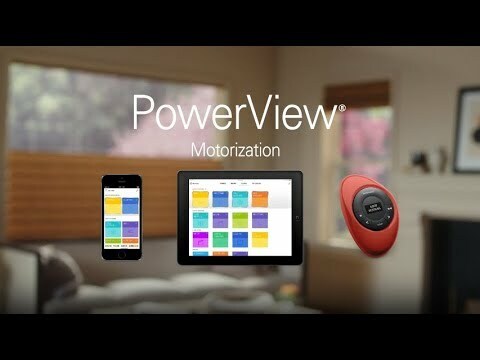 The PowerView App unlocks the full potential of PowerView Motorization. Using the App, you can control your shades with a swipe of a finger. Or, create customized Scenes that move the shades to positions you set, and automate those Scenes to operate on their own throughout the day. Use the Automations feature to set your Scenes to operate independently, whether you are at home or away. You can even schedule Scenes to operate with the sunrise or sunset based on your location. The PowerView system can be operated via the PowerView App or Pebble Control. The Pebble Remote Control offers a modern alternative to a traditional remote control, allowing you to preset and easily operate up to six different groupings of window treatments—individually or together—with just a press of a button. Ergonomically designed and beautiful to look at, the Pebble is available in ten stylish colors to enhance any décor. The Pebble Scene Controller allows you to trigger your pre-programmed scenes on demand. Both are also available as Surface Controls that can be affixed to a wall. Our elegantly designed Hub connects wirelessly to your WiFi network. It’s the central point of control for all your home’s PowerView window treatments, storing your settings and activating your Scenes. The PowerView Repeater extends the signal range of the Hub to carry commands throughout your home. Added bonus: its soft glow provides customized illumination when plugged into any outlet. Good design comes with a seal of approval—the Red Dot Product Design Award. It’s a highly desirable industry award, and both our PowerView® Hub and Repeater earned it in 2018. The Remote Connect™ feature allows you to operate your shades from anywhere in the world using your mobile device. Along with the added convenience of cordless operation, PowerView Motorization creates a safer environment for homes with young children and pets. Most PowerView motorized window treatments are battery-powered, so they’re incredibly easy to install, operate and maintain. The battery pack is hidden behind the headrail so there’s nothing to mar the beauty of your window treatments. PowerView also seamlessly integrates with other sophisticated whole-home automation systems. Amazon, Alexa, and all related logos are trademarks of Amazon.com, Inc. or its affiliates. Apple, iPhone, iPad, Apple Watch, Mac, and HomePod are trademarks of Apple Inc., registered in the U.S. and other countries. HomeKit is a trademark of Apple Inc. Google is a trademark of Google LLC.